Monday: Work. On call. Not much to do but search for some decent lighting reviews. Charged up some batteries for a test of the Camelion Charger for the 705. Tuesday: Work. On call again. Half discharged the 705 it took 2 2000ma/hr AA batteries to get it back to full so wants a bit of looking into before I do an article on it. Wednesday: Work. Spin class at Europa Pools, just. Spent an hour getting home due to hitting traffic on Runcorn bridge. It was a split second decision whether to set the Tacx up and change the tyre or jump in the car and get to Europa Pools for Sheila’s class. Sheila won out. Had a good class with 17 mins in zone 3 and 12 minutes in zone 4. Sheila uses a radio mike which gives her a lot of control over a small class. Again sections where the aim was posture and technique. Shower and home. Blog and watch Axemen and Paul Merton. Thursday: Work. Spinning class at West Kirby, shower and home. Picked up the comic on the way home along with a 69p pineapple from Aldi only to see it all over the TV when I got home. Friday: Off. Lost a kg. Had a look through the Wirral News and there is a letter from someone who got a parking ticket at 18:20 at Europa Pools. I’ve mentioned before that this is the last carpark before they clock off at 6:30 at Hamilton Square. With winter here they’ll be inside out of the weather waiting for some one else to take a chance. Minimum time is an hour which is £1 compared to West Kirby which is 30p. Went to watch Quantum of Solace. Might need to watch it again before I pass judgement. Good film though. Spinning class at West Kirby, another two first timers signing the death warrant. They got through Ok but complained of sore backsides as virtually everyone does. Tesco’s for some gel saddles I think. Shower, home. Saturday: Ride day, checked the bike out yesterday. Winter bike it is, rear lights and maybe a headlight. Turned up at the Eureka slightly late and it was full of Northenders. Had my breakfast as I rode out on empty. Three rides going out today, I’d opted to go on an ICF (Ice Cream Farm) ride. There was a lot of mud on the road on this ride with everyone opting to ride with mudguards except the first timer on the ride. Depending on what you are looking for this was one of a 100 ways to reach the Ice Cream Farm. I’ve done a pretty similar route with the Northen about a year ago. The Capenhurst lane route that is a given from the Eureka depending on what direction you are heading out was particulary muddy. When I say mud, there were six inch clumps of it from tractor wheels dotted around the road. Our progress was slower along with the motorists that were stuck behind. There was a few bits of inconsiderate driving the most notable being around just before the pond at Christleton. A prat of a boy racer seems to wants to take chunks out of me and the first timer I’m talking to. Being tailgunner for this section of the ride this means I’m on the back. There is a bit of a split around Waverton with a couple taking a more direct route to the Ice Cream Farm. With a bit of a U turn I ended up with the original group. Being a member of a big club means you get the choice of at least three rides on a Saturday. Ours would be classed as a ‘B’ ride but it didn’t stop us nearly catching the ‘A’ ride at Backford trafficlights and passing them when one suffered a puncture. 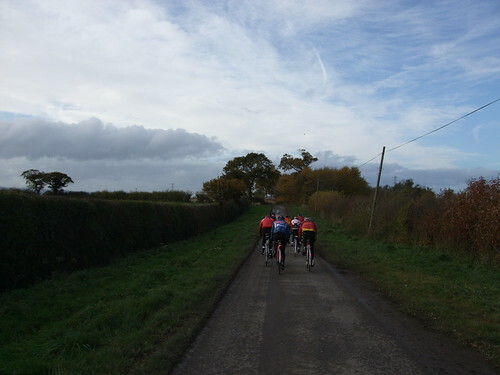 Thats the thing with club riding, the larger the group the more chance there is to go wrong. Riding through Cheshire at this time of year means the roads are pretty snotty due to all the hedge cutting (punctures) and ploughing (mud). Mudflaps on the counter at the Eureka for 50p (for charity) just confirm it. It was dry on the way back but we did have a split crossing the A41. 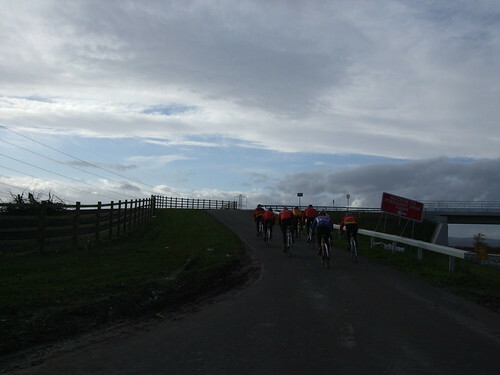 This led to half of us taking the Chester cycle path back to the Eureka with us using the new A5117 bridge. Had a really good day, more later……. Loving this website Frank…I’m the instructor that took you on the Sunday that Barbara missed (Alex). Nice to read your comments about all the classes and nice to see that a class participant takes it seriously enough to take time to leave feedback. Would love your email address to email you…. Hi Alex thanks for leaving the comment. I think it is only Barbara that hasn’t found or read the site. Such is the power of a Google keyword search I was third in Google if you did a search for Spinning Calories Burnt which is some feat. I get about 300 hits a month looking at the spinning posts from all over the world.